Here’s a handy chart from the American Telemedicine Association showing the current status of telemedicine legislation in all 50 states plus D.C. Specifically, it shows which states have already mandated private and Medicaid insurance coverage for telemedicine services, as well as which states are considering such a law. (Medicare policy of course is set at the federal level.) This information is current as of this month. 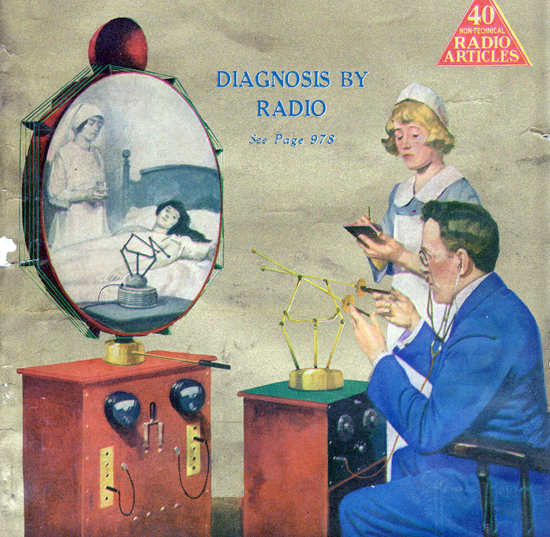 I saw an interesting article today on Smithsonian magazine’s Paleofuture blog, suggesting that an early radio and publishing professional may have predicted telemedicine as early as 1925. According to the article, that person, Hugo Gernsback, predicted that within 50 years, by 1975, there would be a contraption he called the “teledactyl.” With this device, physicians would be able to see patients on a television screen (TV did exist in 1925, though it hadn’t reached the masses) and also “touch” patients with radio-controlled arms. Here’s how Gernsback visualized it, on the cover of the February 1925 issue of Science and Invention magazine, which he published. Incidentally, according to the Smithsonian article, Gernsback just a year later launched a new magazine called Amazing Stories, supposedly the first publication fully dedicated to science fiction. Clearly, though, there was more than a little truth in the 1925 forecast.